The What: Synthax will showcase the new RME Fireface UFX+ Interface with Thunderbolt and USB 3 connectivity, which enables operation with both Mac OS X and Windows, with support for hot plugging. 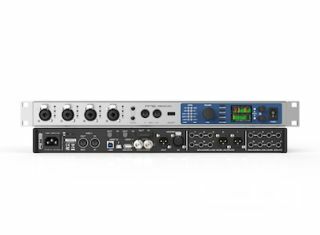 The What Else: The UFX+ has a robust channel count: 12 analog, 16 ADAT, two AES, and 64 MADI for 94 channels input plus output, equaling 188 channels total. The Fireface UFX+ includes DURec (Direct USB Recording) and RME’s low-latency hardware and driver designs. The maximum number of recordable channels is 94, meaning all 12 analog inputs plus 64 MADI channels can be recorded simultaneously. Optionally available for use with the interface is RME’s new ARC (Advanced Remote Control) USB. This remote connects directly to the Fireface UFX+ or any computer—providing tactile TotalMix FX control. The Bottom Line: The UFX+ Interface will be available in August of 2016.